Life's a Beach | Expat Life in Playa del Carmen : Eco-Contest for Playa del Carmen Families to be Hosted at Ak Lu'um! 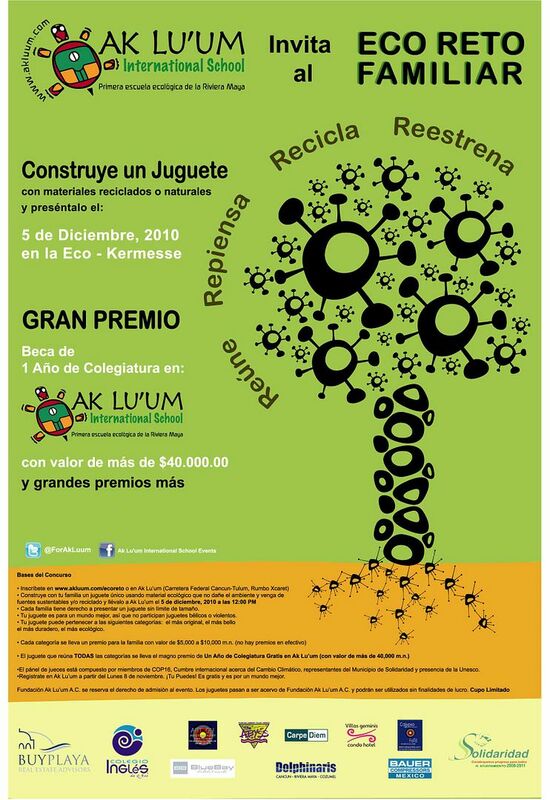 Ak Lu'um International School, the first ecological school in Mexico invites you to take part in the 1st Annual Eco-Challenge on Sunday December 5th 2010! The Contest: As a family, design and build a unique toy or game that does not harm the environment using organic materials, materials that come from sustainable sources and/or recycled objects. Each family is entitled to present a submission with no limitations on size. This toy is for a better world so please, no toy guns or violent themes. The event will take place on Sunday, December 5th at the Ak Lu’um International School. Judging, selection of winners and awards presentation will be done that day. The panel of judges will be composed of members of COP16, International Summit on Climate Change, and representatives from the Government of Quintana Roo and the Municipality of Solidaridad. Event organizers invite local organizations to participate in this one of a kind event. Sponsors are needed to provide prizes. There will be a marketplace pavilion where local retailers may offer their products and/or food services. Space is limited. To register, visit the event web page. *** Ak Lu'um A.C. Foundation reserves the right to refuse admission to the event. Toys become the property of Ak Lu'um A.C. Foundation and may be used for non-profit purposes.